When I got on the computer yesterday morning, the story was the first one I saw. I truly felt sick to my stomach. The feeling never left. 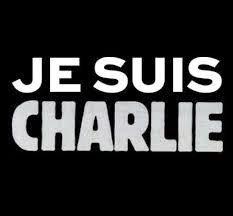 I sat transfixed at my computer the entire day, watching The Guardian's live feed and looking at Twitter, clicking links to carry me to Charlie Hebdo covers from years past to the video of the policeman on the ground holding his hand up to comic images of defiance and sorrow from artists to photos of seas of people NOT AFRAID and JE SUIS CHARLIE. I was saddened and enraged. I am still saddened and enraged. I'm not naive. I've never been naive. The awareness that madmen will take their madness from their desert enclaves and bring it to us was awakened even before September 11, 2001. It's a reality that's reinforced again and again. Facing that reality never gets easier. It was made even more difficult yesterday. Some opinions and ideas offend me. I'm sure some offend you as well. I will defend your right to offend me again and again. I am one of those people. I was disgusted by Skokie. I was disgusted by Piss Christ. I am repeatedly disgusted by films and literature that depict the most vile acts and use incendiary words to provoke. I am disgusted by USA Today giving a platform to that fucker Anjem Choudary. Offend away, folks. I will leave the web page or change the channel or not watch or read. But I will not prevent you from offending me. And I will be saddened beyond words when people take your lives in the name of a fictional being because you offended them. And I will not know how to do anything about it.